"In all professional endeavors, rigorous standards of accuracy are required. Scholars cherish their freedom of expression. But full freedom cannot be experienced if part of one’s knowledge is ruled 'out-of-bounds' by edicts of men. 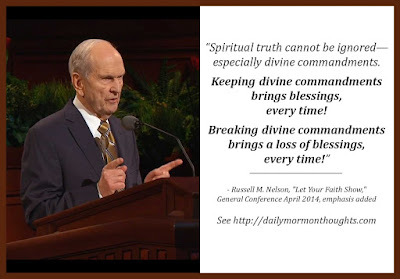 "Spiritual truth cannot be ignored—especially divine commandments. Keeping divine commandments brings blessings, every time! Breaking divine commandments brings a loss of blessings, every time! (See Mosiah 2:41; D&C 58:30–33; 82:10. This principle is true for everyone, for 'God is no respecter of persons' (Acts 10:34; see also Moroni 8:12).)" 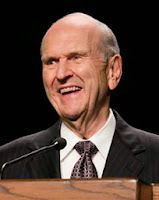 President Nelson's message is really quite simple. Truth is truth, eternally—whether it comes from science or revelation. And it is only in following that truth that we can truly find blessings and peace! One thing that is always fascinating with President Nelson is to study the footnotes. There is always great material there to supplement his talks!